Five years between albums is an eternity in todays rock marketplace, but Boise, Idaho's Built to Spill is one of the few acts that can rely on an adoring, emotionally-attached fanbase to be loyally waiting for them, no longer how long the layoff. Issuing his bands' first CD since 2001's underrated "Ancient Melodies of the Future," melodic guitar dramatist Doug Martsch is back April 11 with a retooled Built to Spill, expanded from a trio to a quintet. 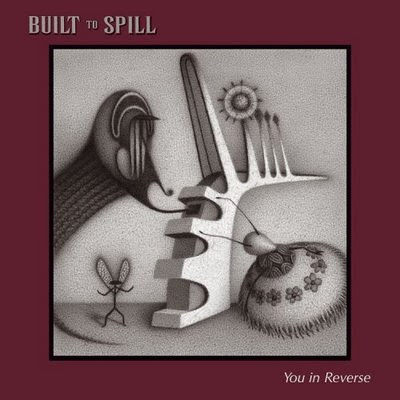 Consider this a rebirth; besides the addition of new members Jim Roth and Brett Netson, it's the first album Built to Spill has self-produced. With it use of analog equipment and a loose, recorded-live approach, You in Reverse should prove to be the most organic-sounding Spill yet. An initial listen to the lead track, "Goin Against Your Mind," currently posted on the bands MySpace page, finds Martsch's plaintive voice and dazzling fretwork intact, but theres also a grittiness and a tendency to stretch out the jams. Patience will surely be rewarded. All good things must come to an end. The recent announcement that this May 9 release will be the swan song of futuristic art-rockers Grandaddy was a serious blow to hipsters and music geeks everywhere. The Silicon Valley-based band never rose above cult status, but they earned truckloads of critical acclaim for frosty yet affecting efforts such as Sumday and The Sophtware Slump. Their warped meditations on life in the computer age continue on Just Like the Fambly Cat, which features 15 more tracks chronicling todays battle between the soul and technology. Song titles like "What Happened," "Summer It's Gone" and "Disconnecty" (sic) suggest the slow disintegration of an act that always sounded too fragile for this crazy world. Grandaddy mastermind Jason Lytle vows to continue his musical endeavors under a different name; until then, this program has been deleted. The fearless freaks return, loud and proud. Wayne Coyne, Steven Drozd and Michael Ivins, three Oklahoma City eccentrics better known as the Flaming Lips, unleash At War with the Mystics on April 4. Though the white-suited Coyne and his band of psychedelic pranksters could have easily rested on their laurels after the tremendous success of the past few years, this is War, no complacent victory lap. Sound-wise, the Lips will still be cosmic and expansive on this effort, their first since 2002's Yoshimi Battles the Pink Robots. But are you ready to rock? Early word has it that heavy guitar riffs and an overall intensity abound here, so this may not be such a Soft Bulletin. Track titles include "The Yeah Yeah Yeah Song" (described by Coyne as MC5-ish) "Mr. Ambulance Driver" (which first appeared on the "Wedding Crashers" soundtrack) and "The W.A.N.D." For serious fans, a special edition of this CD will also be available, complete with a bonus DVD that features additional tracks, videos and a 5.1 audio mix. Look for the band on tour this summer and beyond.